Each year in April, communities across the country celebrate the Week of the Young Child. 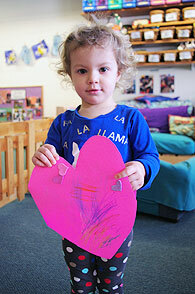 Our community devotes an entire month, making April the Month of the Young Child. This is an opportunity to celebrate the spirit of young children while also supporting their families and caregivers who dedicate their time and energy to support the healthy development of our future generations. There are many events and activities throughout the month, all free, for young children and their families. The 14th Annual Young Children's Exhibit—at the Robt. H. Gibson River Garden, 157 Main St., Brattleboro—showcases artwork made by children attending a variety of childcare programs in Windham County. We would like to acknowledge the hard work of all childcare providers who offer these enriching opportunities to their children and especially those who made the extra effort to curate art work for this show. Young children approach the world with a sense of wonder and curiosity. These are the natural driving forces that influence how children learn about the world. Through observation, exploration, and imitation, even babies begin to make sense of how the world operates and how their actions affect the things around them. 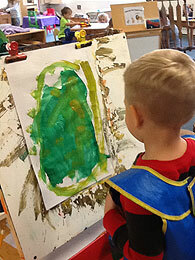 Art is a natural way for children to test and make observations. Giving young children opportunities to freely explore different tools and materials allows for both exploration and discovery. As they begin to make sense of different materials and their properties, children's art becomes a means of self-expression and intentional storytelling. 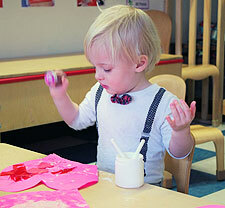 · Fine motor skills: Guiding paint brushes, cutting with scissors, and shaping clay develop fine motor muscles. The strengthening of these muscles supports the development of self-help skills like tying shoe laces and buttoning jackets, and prepares children for the work of writing. · Language skills: When creating art with a supportive adult, children learn relevant vocabulary, including descriptive words (texture, bright, wide, etc. ), names of tools (easel, stapler), materials (watercolor, tissue paper), and processes (collage, sculpting). 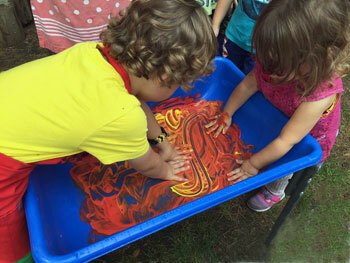 Children practice describing their work to others and listen to other artists describe their work. · Math skills: Creating and talking about art provides the opportunity for children to discuss math concepts like shape and size, making comparisons, counting and spatial reasoning. · Cognitive development: Working with different materials over time allows children to make discoveries about cause and effect (red and yellow makes orange, clay dries, wax resists watercolor). Armed with this knowledge, children eventually practice critical thinking skills such as planning a project, attempting to carry out that plan, and making adjustments as necessary. We invite you to stop by the River Garden to enjoy the 14th Annual Young Children's Art Exhibit. And keep a lookout for other fun events celebrating the Month of the Young Child!